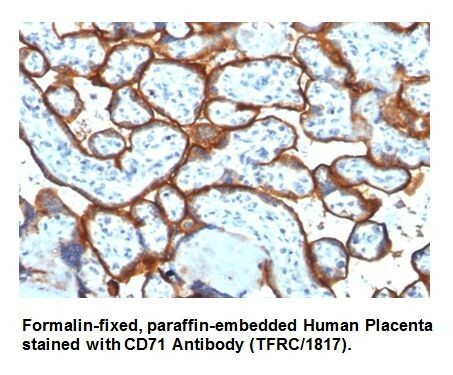 Anti-CD71 / Transferrin Receptor Antibody (TFRC/1817) | A1559 | BioVision, Inc. It recognizes a ~90-95 kDa protein which is identified as cell surface transferrin receptor (CD71), a disulfide-bonded homodimeric glycoprotein of 180-190 kDa. 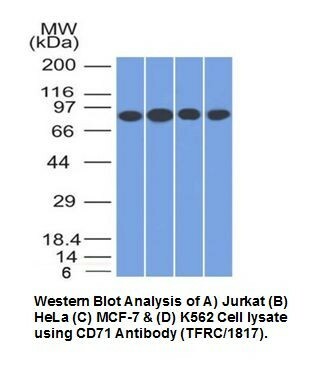 This mAb is highly specific to CD71 and shows no cross-reaction with other related proteins. 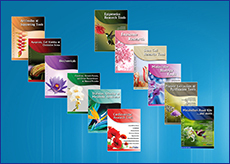 Ligand for transferrin receptor is the serum iron transport protein, transferrin. This receptor is broadly distributed in carcinomas, sarcomas, leukemias, and lymphomas. CD71/Transferrin receptor has been reported to be associated with cell proliferation in both normal and neoplastic tissues and useful in predicting clinical behavior or response to therapy in a number of malignancies including breast cancer.